My husband, our son, and I are cigar enthusiasts, and bought this humidor to have one in the location where we get to enjoy our cigars together on the weekends. To begin, careful attention was given to packaging the humidor for protection during delivery. The exterior matte walnut finish definitely has an attractive appeal, the cedar lining is sufficiently fragrant to anticipate adding character to the cigars, and the box is indeed air tight. The humidifier and hygrometer allow for easy yet careful monitoring, and the included accessories [i.e., ashtray and cutter] are of good quality and add a nice touch. Finally, due to our varied tastes, ring gauges are different, and the box easily holds 20 cigars. That said, I need to qualify the remainder of this review as preliminary, as we have just completed the seasoning process [which was clearly explained]. Thus far, I can state that maintaining necessary humidity levels is a simple process, but I am not yet able to fully judge the degree to which the airing process [we like to age our cigars] will affect the ease of maintaining these levels over time or if the cedar lining will adequately age the cigars while keeping them fresh. I hope this is useful for potential buyers. SRD / Anthony R.
With a beautiful matte walnut finish and all the accessories you could want with a humidor, this is perfect for any cigar aficionado. 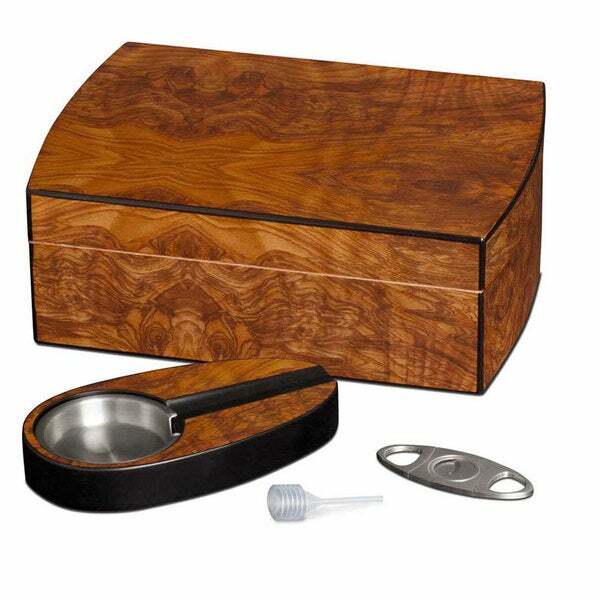 There is an included humidifier and hygrometer to help maintain ideal conditions within your humidor. Easily maintain your humidifier with distilled water to keep it working properly. Also included is a matching ashtray and premium cigar cutter. Grab this innovative and unique humidor set from Visol today. My husband is a cigar connoisseur! So this was a great gift choice. The humidor itself is a little bigger than I had pictured from the picture which was a nice surprise. The ashtray and cutter are wonderful quality as well. My husband loves his humidor. It does take some time to learn how to use properly but once you do, it works flawlessly to humidify your cigars and keep them fresh. Another great overstock Christmas purchase. The humidor is excellent quality it’s solid walnut no assembly required 👍. It arrived well packed in a brown box with lots of popcorn inside the humidor is packed in a white box with foam corners inside for protection. I hope my son loves it I can’t comment on how well it works yet but it looks good. This box is handsomely beautiful. I am a designer and always looking for beauty and function. This piece did not disappoint my client. The little added accessories were a plus. This is a really nice humidor. A little smaller than I imagined but the quality is great/ the extra accessories are a big bonus. Can’t wait to give this to my friend.